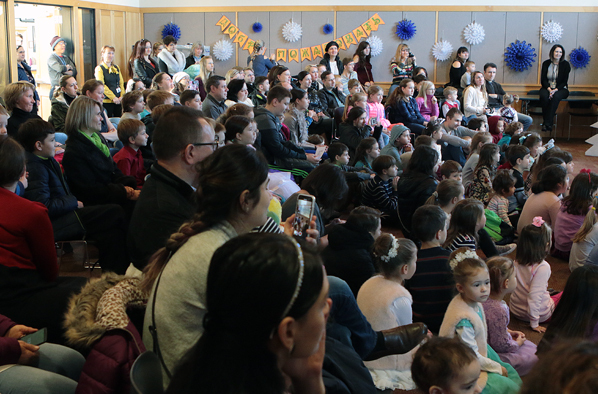 From all over greater Portland, families participating in the Slavic New Year program come to the Hazelwood neighborhood, filling the large meeting room at Midland Regional Library to capacity. 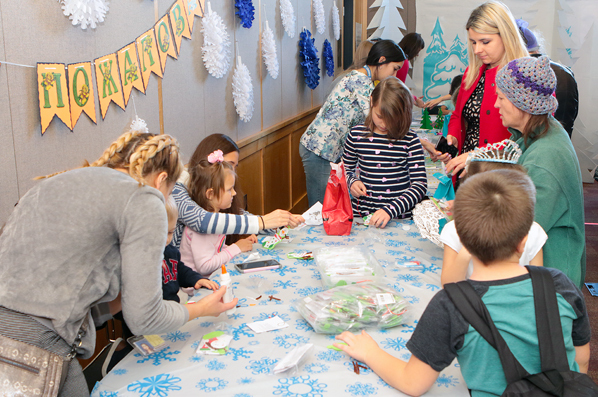 The large room at Midland Regional Library was filled with families – from toddlers to great grandparents – on Sunday afternoon, January 14, as they celebrated the traditional Slavic New Year together. 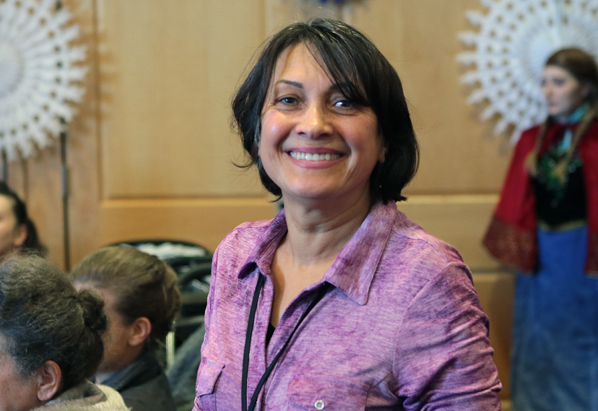 Helping out with festivities is the library’s bilingual Russian library assistant, Natalia Alexandra. “Our traditional Slavic New Year is celebrated on January 15, based on the ‘old calendar’ in Russia; and many people celebrate it on that day,” smiled Midland bilingual Russian library assistant Natalia Alexandra, as a celebratory drama got underway. 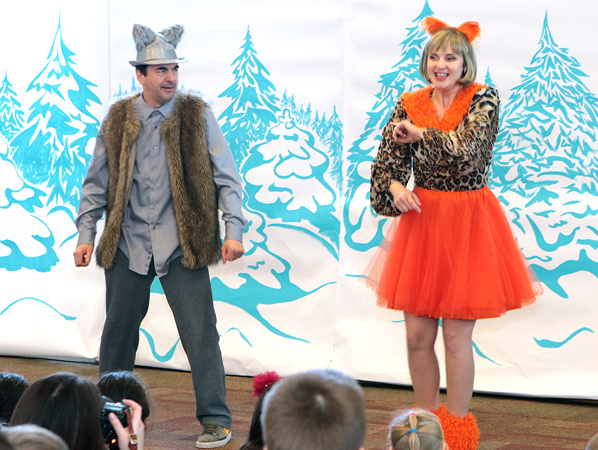 The central characters in this traditional play include Ded Moroz, Grandfather Frost; his granddaughter and helper Snegurochka, the Russian Snow Maiden; and forest creatures including Lisa (“fox” in Russian), Ms. Alexandra told East Portland News. In the forest, Wolf and Fox scheme to steal Grandfather Frost’s holiday gifts, which are intended for the children. 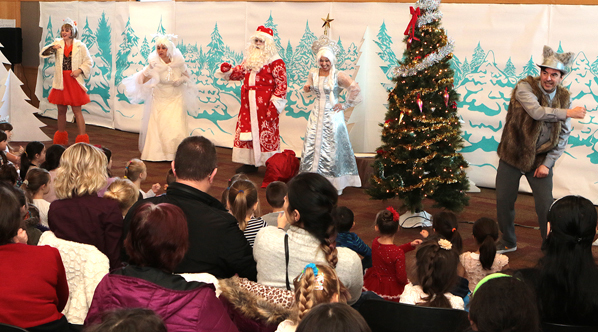 Ready to steal the holiday presents, Wolf and Fox, thinly disguised as Ded Moroz and Snegurochka, sneak into the area – but members of the audience aren’t fooled by the ruse. Everyone in the audience enjoys this comedic situation. “Fox and Wolf think they are oh, so clever and smart, but accidently work against one another, so that Ded Moroz and Snegurochka arrive right on time,” Alexandra confirmed. 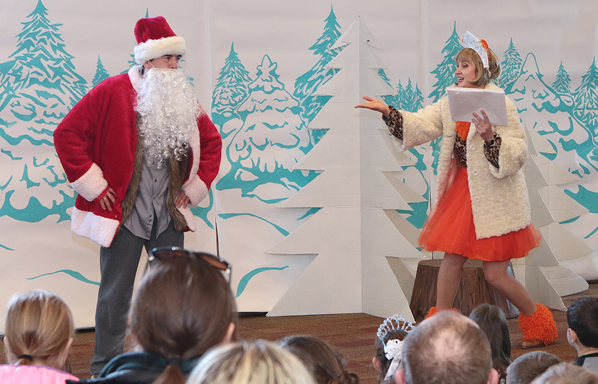 In the end, Ded Moroz forgives Fox and Wolf, and together with Miss Zima, (Miss Winter), leads the audience in a traditional holiday song. The play contains several audience-participation points, including sing-along numbers and quizzes. It was well-acted, exquisitely-costumed and expertly-produced by Scarlet Sails Theater, a professional Russian-speaking theater company in Beaverton. 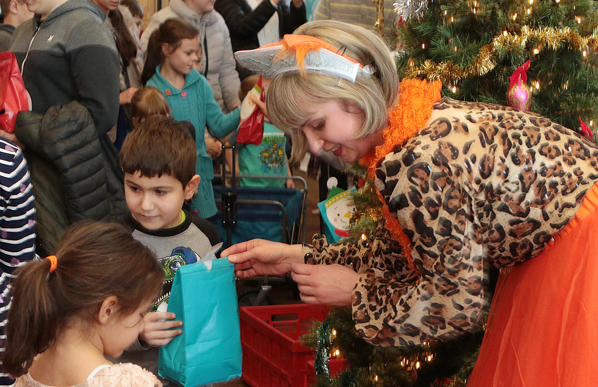 Cast member Olga Sotiriadi, who was playing Fox, helps distribute gifts to children at the program’s end. As in Western “Christmas”, this Russian holiday involves gift-giving. “We prepare many gift bags for children, because it is a tradition to have something special – gifts like candy, and apples in a beautiful package, that they take home with them,” said Alexandra. “It’s important to have a cultural program like this for the Slavic people, because it helps bring the community together,” observed Alexandra. After the formal program and gift-giving, kids are invited to participate in making crafts.